Photo by Dalia Moreno | Bright holiday lights decorate the trees surrounding Vitruvian Park. Millions of colorful lights illuminate the trees in nearby Vitruvian Park, transforming it into a must-see location this holiday season. 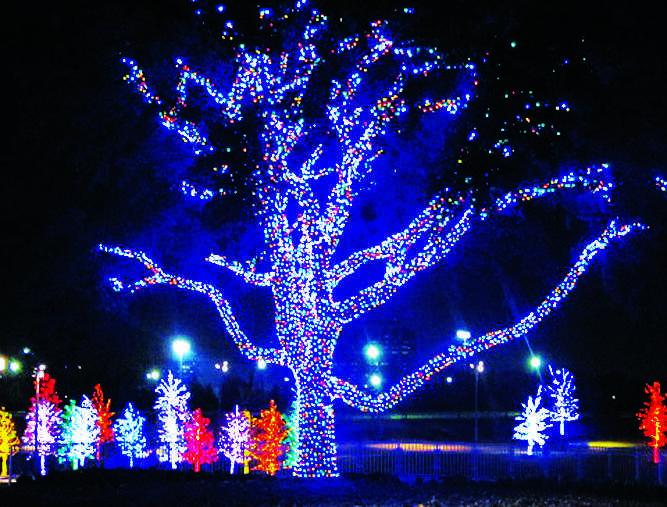 Landscape lighting company president Curtis Frisbie designed the light display, which includes 1.2 million light bulbs in nine different colors lighting more than 500 trees. His company, Southern Lights, was in charge of installing the display that would bring the park to life. The result was a design that stands out from typical Christmas displays. While colors such as red, white and green are used, Frisbie also incorporated non-traditional colors, such as purple, blue and yellow. The array of colors makes the trees reminiscent of those seen in Dr. Seuss books. Frisbie said the installation process began in late September and ended in November. A lighting ceremony was held Nov. 23 to celebrate what is to become a new tradition in the city of Addison. The first three Saturdays in December, Magical Nights of Lights will also include food trucks, musical performances, and visits from Santa Claus beginning at 6 p.m. Visitors will also have the opportunity to do some holiday shopping in the Vitruvian Park retail center. As far as the next light display goes, Frisbie said, “It’s going to be bigger and better next year.” Readers can visit www.vitruvi anlights.com for more information about the events.